330ml bottle. Cloudy, dark golden colour with huge, frothy, mostly lasting, minimally lacing, grubby white head. Citrusy hoppy and sweet-ish, malty aroma, notes of lemon, lemon tea, a touch of lemon zest. Taste is sweet-ish, biscuity, pale malty and citrusy hoppy, notes of lemon, lemon zest, lemon tea, a touch of sugary sweetness; slightly bitter and grassy hoppy finish. Well hopped, very drinkable. Good. 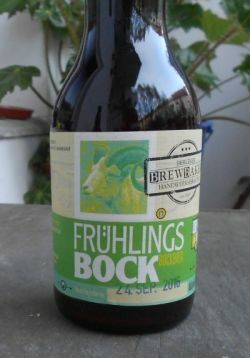 UPDATED: APR 20, 2018 “Brewbaker Frühlingsbock“, Flasche (33 cl) bei Berlin Beer Academy. - Schön malzaromatisch-getreidiger, frisch und rund zitrusfruchtig gehopfter Bock. Zarte Honignoten, ätherische Kräuter. Sehr lecker. Bottle 330ml. @ [ (PBF XI) by oh6gdx - Petalax ]. [ As Brewbaker Bellevue Frühlings Bock ]. [email protected] XI. Golden colour, mediumsized creamy white head. Aroma is fruity, herbal, some earthy notes along with some bready malts to it. Flavour is fruity, floral, wooden, grassy and some mild nectary notes. Not very Bock like... A refreshing beer, nonetheless. Draft sample @ Berlin Braufest 2015. Orangée-ambrée, col blanc-cassé. Arôme au nez puissant mielleux acacia, bouquet fleuri noble assez léger, citronné restant dans le noble. Palais garde cette impression de miel d’acacia sur un fini assez organique. Malt pâle et cara, le tout légèrement collant aux lèvres. Houblonné noble, fleuri rappelant le Haller ou Mittlefruh. On tap at Braufest Berlin 2015. Pours hazy amber with a white head. Aroma of caramel, malt, citrus and light fruit. Flavour is moderate sweet and light bitter. Medium bodied with soft carbonation.